Another new blog event happening. This time it is an ingenious idea by Stephanie of Dispensing Happiness. Stephanie will be busy plating up finger foods this Thursday. 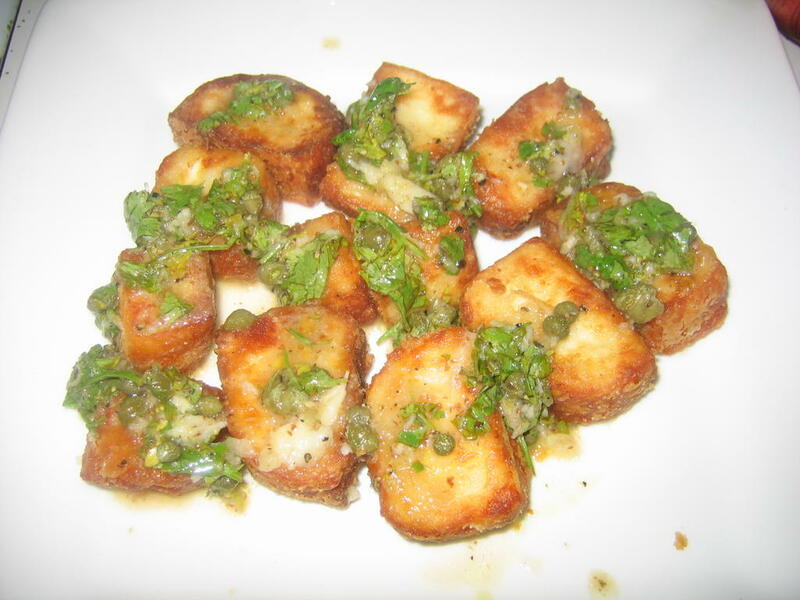 My contribution to her table is Fried Halloumi bites with lime-caper dressing. For those who have not tried the cyprus Halloumi yet, it tastes like a salty, more flavorful paneer. It becomes soft when subjected to any heat treatment but does not become stringy and melted. Pat cheese dry with kitchen paper. Then, using a sharp knife, slice it into 8 slices, including the ends. Now prepare the dressing: Mash the capers slightly and mix in all other ingredients together in a small mixing bowl. Go easy on the salt since halloumi is quite salty. When you're ready to serve the halloumi, heat the oil in a frying pan over a medium heat. When the oil is really hot, press each slice of cheese into seasoned flour to coat it on both sides, then add them to the hot pan and cook 1 min on each side. The color should be a nice golden brown. 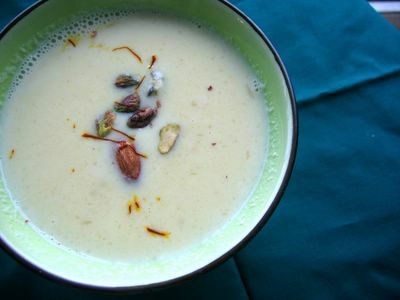 Serve them straight away on warmed plates with the dressing poured over and garnished with coriander. They are flavor-packed bites. You can also serve them on pita or grilled polenta squares. Thanks Stephanie for coming up with a wonderful idea. I can't wait to read the round-up of all the appetizers. Haloumi is a good cheese. We don't have it nearly as often as we should...great entry; thanks for joining in! mmm...fried cheese...MUST make it a point to find haloumi! Squeaky halloumi is one of my summertime favorites! I love the lime dressing on the side. I bet it was wonderful! Mika...the round-up is now up! Yes! I'm so excited to hear you acknowledge this fab cheese! Yum! I finally got around to trying this, after having it on my "to try list" for ages. It was a raging success, and I absolutely loved it! Thank you!